If you don’t research the software you install, sooner or later you could install the unreliable iShopper. This application is often promoted by unreliable installers that bundle useless but attractive-looking programs together with clandestine, malicious threats. The program officially presented at getishopper.com can be very attractive to some users, but, in reality, it is a security threat that you need to delete from your PC. We have conducted a few tests prior to creating this report to help you remove iShopper. The suspicious iShopper belongs to the newly discovered family of adware, Shopmania. PriceExpert, Shop Scouter, and Price Wagon are a few other ad-supported apps that belong to this family and that also require removal. Even though it is unlikely that you will have to worry about the removal of these particular programs if iShopper is already active, you might encounter PC Optimizer Pro, adware from the Justplugit and SuperWeb families, and other threats. We suggest using a legitimate malware scanner to know which iShopper-related programs you might have to delete from your PC. A legitimate malware scanner will inspect your operating system and will inform you about all of the threats that you need to delete. You cannot ignore what such a tool finds, because some of the threats could be particularly dangerous to your virtual identity. iShopper is not the kind of threat that can cause serious damage -- unless you interact with the ads that it showcases. These ads are unpredictable, and it is impossible to say what sort of outcome you might encounter. In the worst case scenario, if you don’t delete iShopper, this adware might expose you to camouflaged malware installers and install intrusive web cookies. iShopper is usually found on operating systems that are not protected by reliable security software. If this kind of software existed on your PC, unreliable ad-supported programs would not get a chance to slither in, which means that you would not have to worry about their removal. Unfortunately, if you do need to delete iShopper from your operating system, it is likely that there are other unreliable programs that await removal as well. Do you have experience detecting malware that must be deleted? If you do not, it is best to install a reliable malware scanner, such as SpyHunter, to inspect your PC for you. At the moment, iShopper only works with the Google Chrome browser, but it is so unpredictable, that we have decided to add removal instructions for Internet Explorer and Mozilla Firefox users as well. Note that the manual removal guide below is not always effective, and, if a malware scanner detects leftovers after you attempt to remove iShopper manually, you should use automated malware removal software. Click the Start button on the left of the Taskbar and open Control Panel. 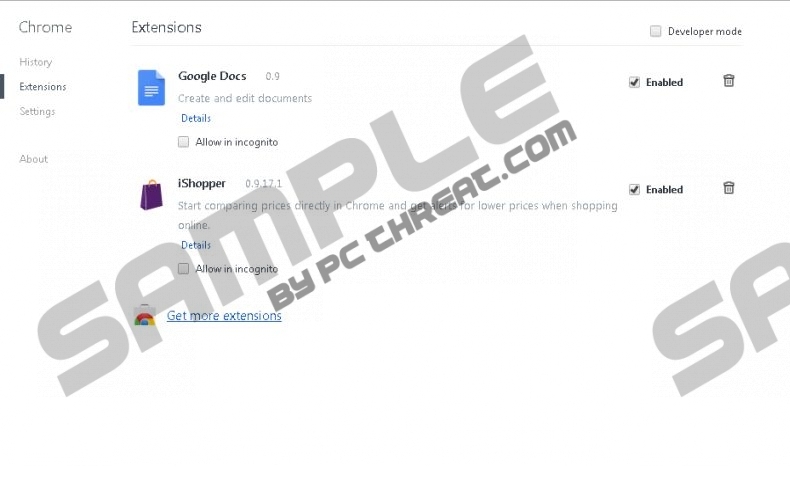 Double-click Add or Remove Programs and find the undesirable app. Select Control Panel to find more options and select Uninstall a program. Access the Metro UI screen and move the cursor to the bottom right corner to open the Charm bar. Click the Search icon and use it to access the Uninstall a program utility. Quick & tested solution for iShopper removal.